Hungary's Satirical 'Two-Tailed Dog' Party Will Debut In Sunday Elections : Parallels Candidates dress up as a chicken, a gorilla and Santa Claus. The satirical party uses humor to defuse fears stirred up by Hungary's nationalistic government. They promise free beer and eternal life. 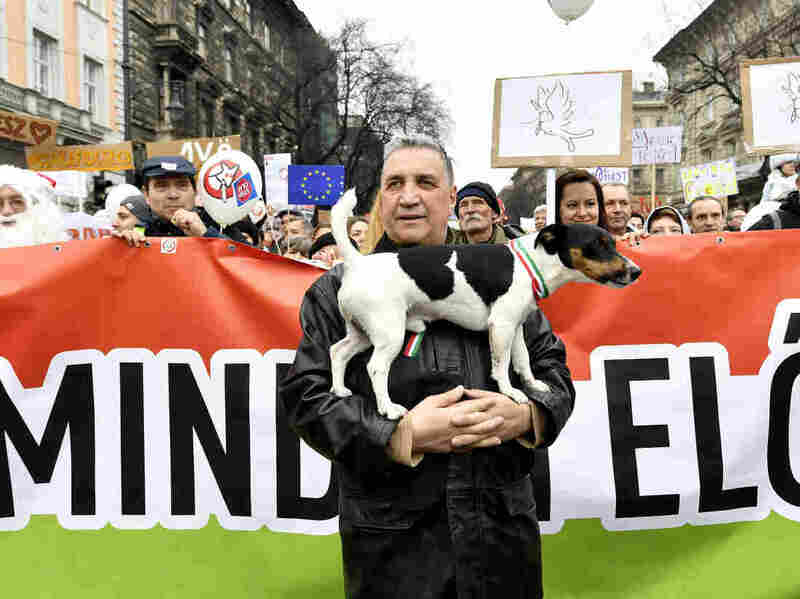 A man holds a dog as supporters of the Two-Tailed Dog Party march in the streets in Budapest on March 15. Gergely Kovács, the party's founder and leader, said it all makes perfect sense: "Santa Claus has got lots of spare time because he works only one day a year, so he can campaign for us." The invisible man, he added, "is very useful because it's very easy to Photoshop him" onto pictures of important people like the pope. As for the chicken and gorilla, "We are a dog party, so we welcome animals." Who wouldn't want to vote for his party? It promises free beer plus eternal life – plus 20 years, because the party had to sweeten the pot now that it is running in national elections, Kovács explained. Its 39 candidates have their own platforms. Kovács, for example — who is running without a costume — pledges to replace rich residents with poor people in his ritzy hilltop neighborhood overlooking Budapest. "Not the whole population, only about 20 percent," he said — to improve the mood of residents who feel outdone by their wealthy neighbors. The "gorilla," Budapest resident Veronika Juhász, is promising "not to promise anything" to her constituents. Except, that is, to build a launching pad for rockets filled with the "cuddle hormone" oxytocin to promote world peace — and to plant trees. "Well, basically, I am a gorilla gardener, so that's my job," she said, drawing stares during an interview in her gorilla costume with NPR on Budapest's Margit Bridge. "Usually it's mistakenly written as 'guerrilla gardening.' It's actually 'gorilla gardening' ... in a jungle like this. 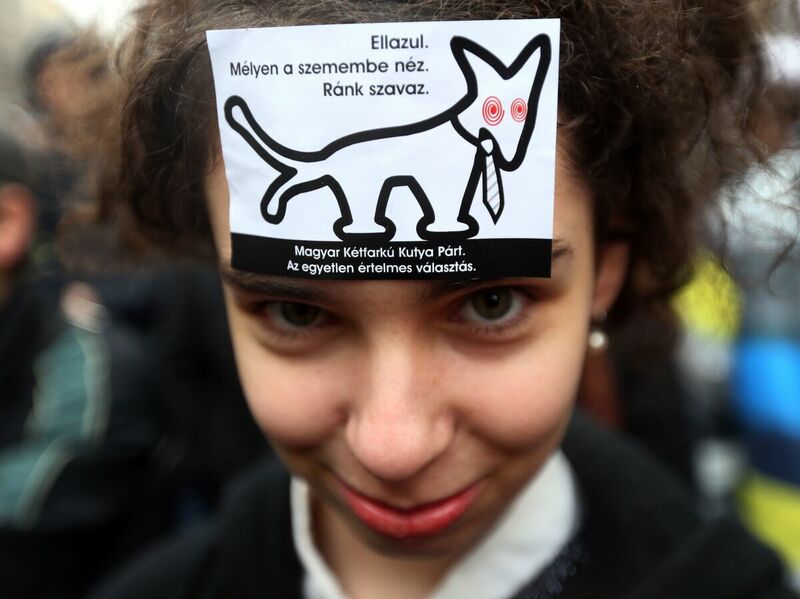 A protestor wearing a sticker reading "Relax, look deep into my eyes and vote us" takes part in a march by the Hungarian satirical Two-Tailed Dog Party in Budapest on March 15. "It's my first time running for office," she added. But "it's not my first time running to the office, because usually I'm a bit late." Kovács said he draws inspiration from other political satirists, including the Yes Men, an American activist, anti-consumerist duo that tackles social and political issues, and Germany's Die Partei, or "the party." Die Partei only has one member in the European Parliament, but "you know German humor," Kovács quipped, "so it might be hard for them to make a joke party in Germany." He said running for office was something he never envisioned when he founded the party, named for the English saying about being as happy as a dog with two tails. At first, its main activities were performance and street art, as well as posters parodying the political elite. But things became more serious when Two-Tailed Dog began tackling national issues — like the Hungarian government's vilification of mostly Muslim migrants. In 2016, when Prime Minister Viktor Orbán organized a referendum to snub Brussels over the European Union's refugee distribution plan, the satire kicked into high gear. Hungarian government billboards saying "Did you know? Migrants were responsible for the Paris attacks" or "Did you know? Brussels wants to resettle a town-full of migrants in Hungary" were countered with Two-Tailed Dog retorts such as: "Did you know? Over one million Hungarians want to relocate to Western Europe" and "Did you know? There is a war in Syria." Orbán's referendum failed because only about 40 percent of eligible voters took part. Hungarian elections officials later fined the satirical party $3,100 over its campaign to get referendum voters to invalidate their ballots. Some 6 percent did. The legal issue arose over Two-Tailed Dog encouraging voters to upload pictures of their desecrated ballots; photographing ballots is illegal in Hungary. A Hungarian court reduced the fine to $390, but in January, the European Court of Human Rights in Strasbourg ruled against Hungary altogether, saying it had violated the EU's freedom of speech principle in the case. During the current election season, Two-Tailed Dog generated enough public support to qualify for campaign funding, which the party said amounted to $750,630. The party said that prompted a new initiative called the "first people's campaign money squandering fund," in which the party is funding community projects, including a mobile planetarium and a van for "clown doctors" who treat the seriously ill and help make them laugh. How popular the party actually is among Hungarians isn't clear. Kovács can't even say for sure how many members his party has — they've never been counted. But political humor has a long tradition in the Central European country and historians say it was a popular form of passive resistance during the Communist era. "They [Two-Tailed Dog] have an impact on the discourse in Hungary," said Gábor Győri, a political analyst at Policy Solutions, a progressive think tank in Budapest. But, he said, "I don't think they have much of an electoral impact. Apart from saying that the entire political elite is rubbish and essentially and should be replaced, they don't have much of a program for Hungary." Győri is among Hungarians who criticized a recent appearance by Two-Tailed Dog's chicken candidate on Hungarian state television, on which opposition parties were given only five minutes to state their campaign platform. The chicken candidate, who appeared in costume, drank water and clucked as the commentator asked him questions. The mocking response resonates with Hungarians, given that "we have a government that is increasingly autocratic, and we have an opposition that appears impotent," Győri said. "At the same time, I think that somebody using five minutes of national television by clucking as a chicken is not the best use. Somebody I heard said it best: 'I think for the first minute it was funny, and after that, it became kind of embarrassing.'" Hungarian government spokesman Zoltán Kovács said he's not worried about Two-Tailed Dog peeling away legitimate votes. "Humor has always had a role in politics. We believe it still has," he said. "But it's obvious that the government parties are the ones actually who are carrying the message that is for the interest of the Hungarian people." But at least one Two-Tailed Dog candidate has a fighting chance of winning, Gergely Kovács believes. That would be the chicken. Also known as József Tichy-Rács, he has become rather famous, Kovács said. Toward the end of his controversial TV appearance, Tichy-Rács clucked out binary code spelling the words "free beer."